The view of the hearth room, kitchen, and living room reveals the complicated geometry of the space. 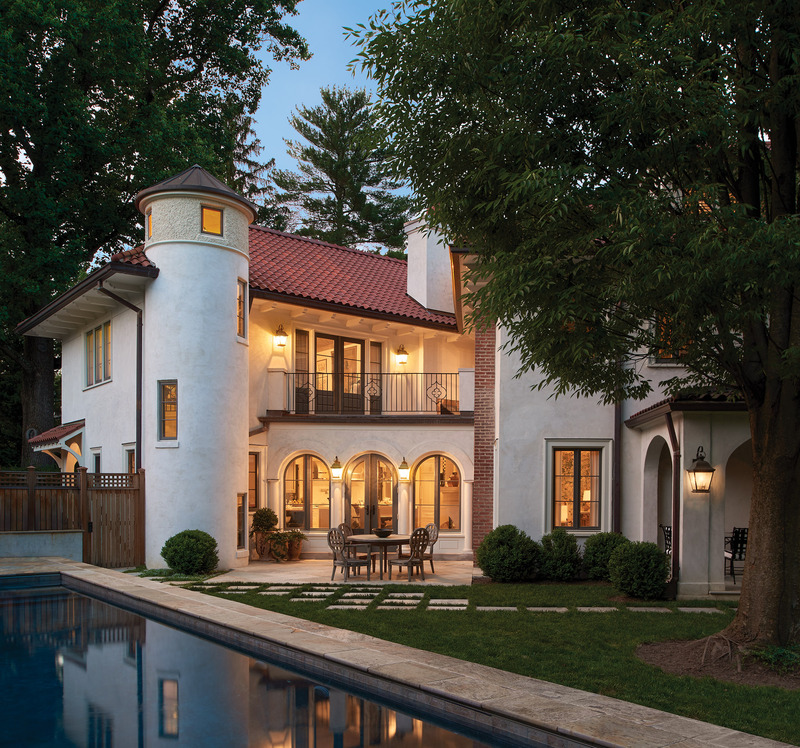 The Mid-Atlantic united states is hardly the Mediterranean, but you’d be forgiven for feeling somewhat transported once you arrive at a certain Barnes Vanze Architects project in the Washington, D.C., suburb of Wesley Heights. The home, with its unpainted natural stucco exterior and clay roof tiles, clearly evokes southern Italy or France. But the home’s interior was jarringly different from its exterior before Barnes Vanze Architects came along. 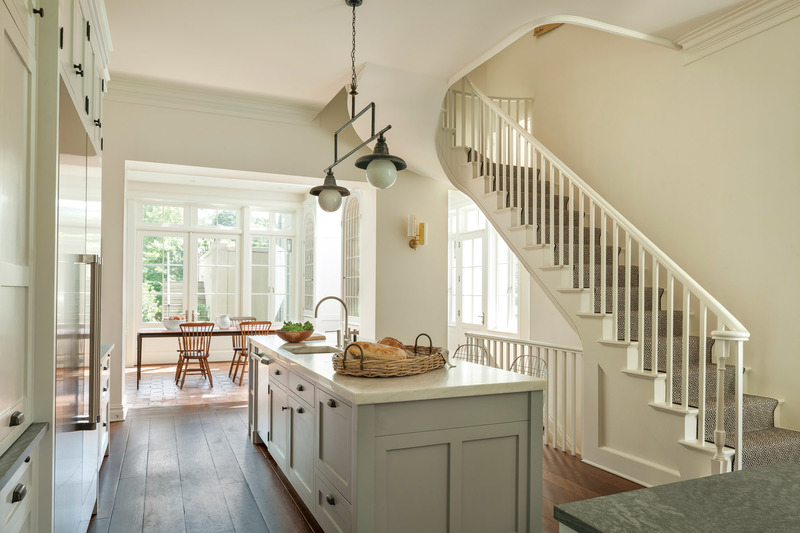 “All the details inside the house were ‘colonial’,” says Anthony “Ankie” Barnes, FAIA, LEED AP, a partner at Barnes Vanze Architects—down to the generic trim and double-hung windows. Such disjointed design was common of spec homes built in the 1920s, as Barnes says this house likely was. “On the interior we wanted that feeling to come through, but not to pretend we were in Milan or in Rome,” Barnes says. The result is a home that is inspired by and speaks to those traditions, but with a fresh, clean, contemporary feel. A dining terrace is found just off the kitchen. Among the project’s most dramatic changes was removing what Barnes calls a “bad addition” and adding a new one to the rear of the home that includes a new stair tower, with a solid limestone spiral stair, a master suite, and a large space that incorporates a kitchen, breakfast area for informal dining, and family room that’s divided only by architecture and geometry. 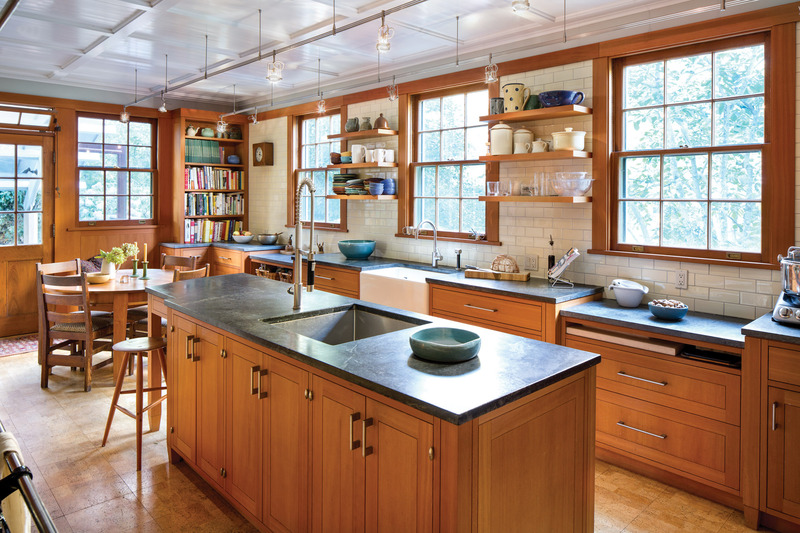 For instance, a barrel vaulted ceiling in the kitchen clearly defines the kitchen as one space, while beams run at slightly different angles across the ceilings of the sitting and breakfast rooms. A single, solid turned-oak Roman Doric column also spatially separates the kitchen from the seating and dining areas. “It’s sort of reminiscent of what you would see in the Mediterranean, classical Europe,” Barnes says. The new kitchen is “real cook’s kitchen,” and is a vast improvement over the cramped, outdated former kitchen that overlooked the driveway. Now, the kitchen is bright, open, and highly finished, with a large island. The space is formal enough to entertain guests with glasses of wine, but easy-going enough to give the kids a bagel at the island, Barnes says. Everything the chef needs, including the refrigerator, cooktop, and a walk-in pantry, is on the working side of the island. The kitchen view is prettier, too. A Juliet balcony sits over the front door. “The stove and the hood are a big statement in this house,” Barnes says. 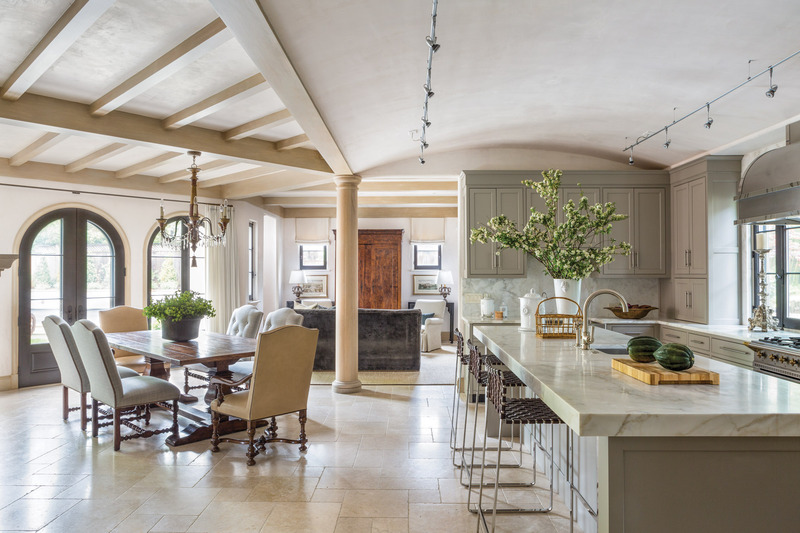 A travertine floor running through the kitchen, breakfast, and sitting areas unites the space as well. On the other side of the family room, the limestone spiral staircase leads down to a wine cellar, while across the kitchen and breakfast room area, French doors lead out onto a paved terrace. A transition space leading off of the kitchen also helps to “tame” the odd angles of the house, which is sited diagonally on the lot. The solution is another nod to the Mediterranean influence: A groin-vaulted hallway, hung with lanterns, which leads from the kitchen and turns 45 degrees at the end into the library. The interesting transition keeps awareness away from the strange geometric shift, Barnes says. 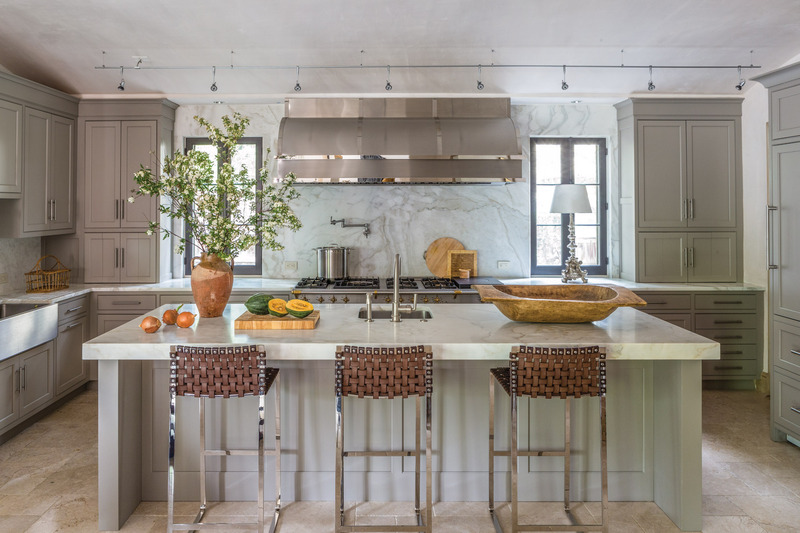 The subtlety of the design has been perfect for showcasing the family’s exquisite collection of art and antiques, allowing those objects to shine, Barnes says. And although home’s design is highly curated and sophisticated, the family who lives there is young and active, and Barnes notes that it’s an extremely comfortable place in which to live and raise a family. 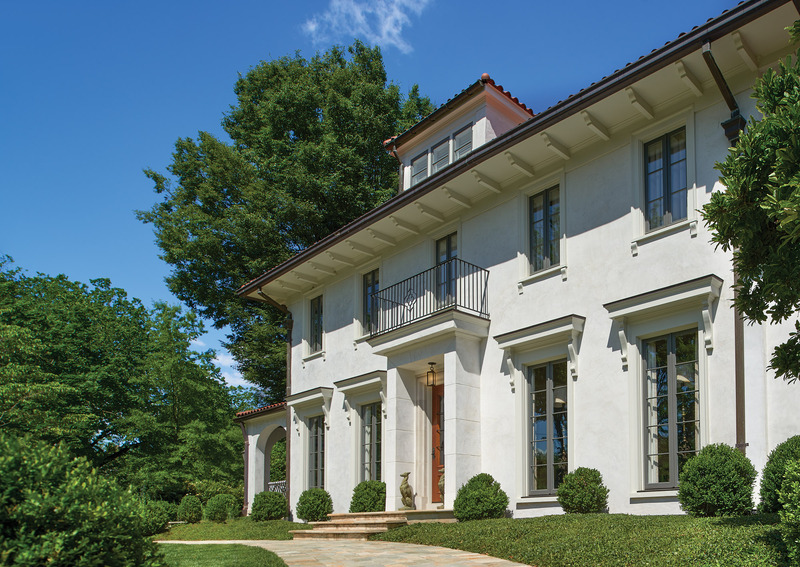 A natural stucco is left unpainted for a Mediterranean feel. 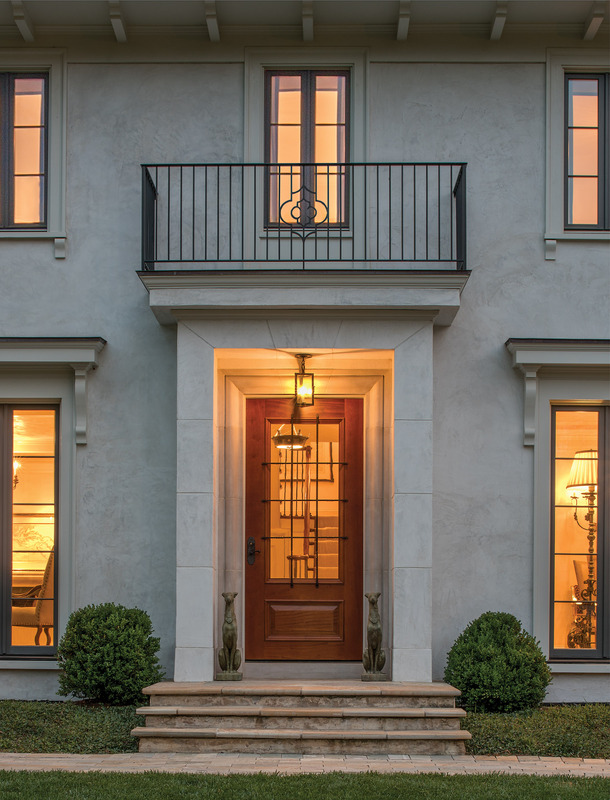 Barnes Vanze Architects was asked to make this home’s colonial-style interior match its Mediterranean-style exterior, but the client didn’t want to “pretend” the house was in Italy. 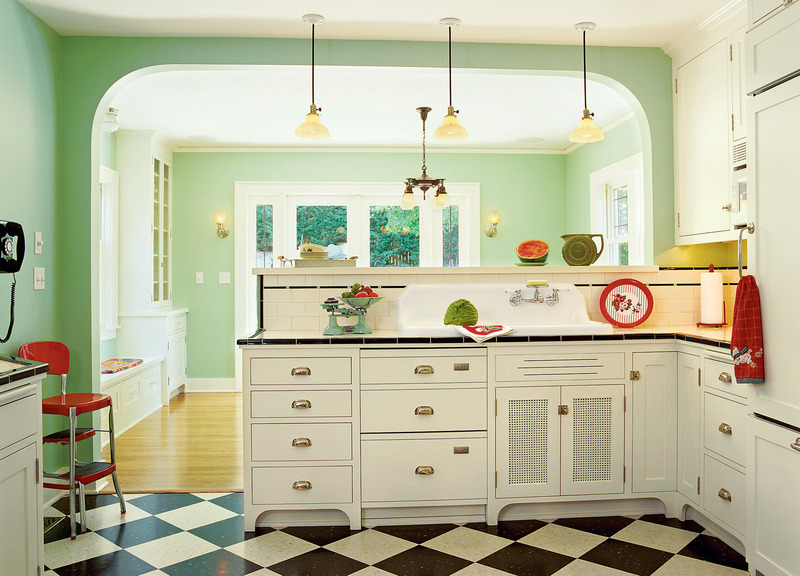 The result is a design that tips a hat to Mediterranean influences while retaining a modern, clean aesthetic.